It "has the worst torque range of any vehicle on the market"
The suggestion that it is prone to "Embarrassing - not to mention dangerous - situations...."
The implication that Subaru has produced misleading performance figures in the statement: "we can't help wonder where the 50-horse nitrous shot was hidden!" We feel that these statements go beyond the bounds of objective journalism. Given the heavy criticism, I'm surprised and disappointed that we weren't offered any opportunity to respond, but that's unfortunately too late now. As you are aware, these vehicles are sensitive to fuel quality and oil grade and we make every effort to have them prepared to the highest standards. Was there a problem on this occasion? I'd have liked the opportunity to investigate, but you didn't alert us. We pride ourselves on providing media access to our engineers and technical experts (I understand from other media outlets that this is something of a rarity) and we would have been happy to discuss any of these issues. To say that this car has the worst torque of any vehicle on the market is a rash statement. Are we seriously expected to believe that it produces worse torque than any other vehicle, bar none? Subaru has built its reputation on quality engineering, safety and a fun driving experience. To suggest we have produced a dangerous vehicle in some parameters is unacceptable. Indeed, it would not gain Australian Design Rule approval if this were the case. We take exception to your implication that we produced misleading performance figures. There is absolutely nothing to be gained in doing this, as it would only create negativity and disappointment among customers and the media. Motor magazine recently ran its own tests and achieved a 5.53 second 0-100km/h figure. We quote a figure of 5.45 seconds (independently verified by the NRMA, using its Correvit) - not the 5.25 you quote as our figure. I remain open to your input but perhaps if you'd sought our input before publication, we needn't have reached this unfortunate situation. We respect your right to publish your views, but given the fierce nature of the criticism, we believe it would have been reasonable and responsible to warrant a right of reply. I look forward to your response. We are always happy to print dissenting perspectives in AutoSpeed. We weren't aware of any mechanical problems with the test vehicle, which we took as indicative of the model - as of course is the norm in any new car test. As such we saw no benefit in discussing its characteristics with local engineering staff. We didn't say that the vehicle "has the worst torque of any vehicle on the market", as you have stated. We in fact made the comment about its "torque range". If you can provide for us details on any other new car for sale in Australia that has a narrower range of engine speeds above which 80 per cent of peak torque is developed, we'll gladly acknowledge that the statement was erroneous. We didn't suggest that Subaru has produced a dangerous vehicle. The statement in question was; "Embarrassing - not to mention dangerous - situations like this quickly teach you the MY02 STi is a no-goer at anything below mid rpm. It's tractable - yes - but don't expect any useable acceleration." This statement is reflective of the initial expectations of the driver, ones that were quickly changed after driving the car. As with any car, if the driver has expectations of performance which are unrealisable then dangerous situations are likely to develop. With regard to the quoting of Subaru's claimed performance figures, we apologise for the mistake that we have made. In fact, as you have suggested, the claim is 5.45 seconds, not the 5.25 seconds that we stated in the article. We will correct this figure forthwith. In regard to the performance figures of the car in general, we would suggest that achieving Subaru's claimed performance figures would require driving the car in a manner that would invalidate the Subaru new car warranty, specifically in regard to clutch and gearbox life. If Subaru would like to demonstrate the achieving of these times with the car being driven in a manner consistent with maintaining full private buyer warranty, then we would have to reconsider the statements that we made with regard to performance times. "The STi's ride/handling compromise is about perfect for this category of vehicle." 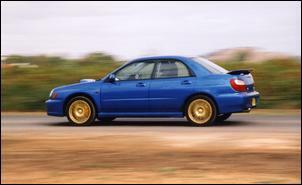 "Handling wise, the all-wheel-drive STi is exceptional." "The result is minimal turn-in understeer followed by enormous traction when you get back on the power." "Speaking of steering, the STi has perfect tiller weight, linearity and feel." "At $55,130 (plus ORCs) the STi offers a combination of practicality, braking, ride, handling, grip and performance you can't match until you reach 80-odd grand Evolution 6.5 land." 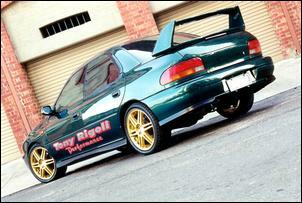 "The STi backs its point-to-point speed with stonkingly powerful anchors." "Handling is fantastic - much less understeer than previous STi's." Just a quick note for the Magna fans out there (C'mon, take off your cardigans and stand up to be counted). While Julian is right about the torque steer in the manual models, by far the better car to drive is the five-speed Sportshift auto. The car will still fry the tyres all through first gear if you nail it off the line, but it doesn't have the terrible torque steer that the manual model has. There is no sudden lurching and lane changing as the car accelerates away, just bewildered looks on the faces of XR6 Falcon drivers who just got chopped by a Magna with four people in it. I can't wait for the All Wheel Drive model being developed for release next year! We have a review of the 180kW Ralliart Magna auto coming up in a future issue. And bring on the four-squealer! Using insulated female connectors to join components to the positive, and male connectors for negative. Using the appropriate gauge (thickness) of wire to handle the proposed current draw. Now, an auto electrician had wired these hi-watt lights some years ago. I got someone else to do the job because I didn't have time and the originals were too dim. He didn't use a fuse between the relay and the battery. He didn't use distinguishable terminals at the lights themselves. I had connected positive to ground, which resulted in a short. The wire burned its insulation off then started to burn the insulation on the wires in the loom around it. The auto electrician hadn't made the system idiot proof, let alone intrinsically safe. My point? What do you have to do to become an auto electrician? Obviously not the same trade qualifications as a home electrician! Can you imagine the consequences of the same thing happening in your own home? It's disappointing when you pay a 'professional' to do a job that you could have done miles better yourself. I admit, I should have chosen someone who was a member of an automotive trade association - you live and learn. This particular 'professional' has gone out of business and I'm not surprised. But is there a qualification such trades people need to have? And to enable those attempting electrical work on their cars themselves is there some good reading to get some basics dos and don'ts? Auto electrics seems to be a 'pick-it-up-as-you-go' trade-the right and wrong way of doing things doesn't seem to be black and white. Do any readers know of any good books? Let us know! In your interview with Nizpro's Simon Gishus he stated that exhaust mods for the LS1 work well initially, however after about 3 weeks the engine management system reprograms back to its original defaults, and most of the gain is adjusted out. My question, which is either obvious, stupid, or both, is can disconnection of the battery every 3 weeks reset the computer to again recognise the power gains for another 3 weeks? Equally, as my vehicle is a Statesman which has a reset mode, can this achieve the same result? Thanks, and by the way, keep up the great work. It's nothing special! Taiwan has a 2.6-litreWRX using custom pistons made by Wiseco (Aus). Unfortunately, the tuning scene here is not so experienced, and despite the 2.6-litre engine it only puts out 600hp at the wheels and runs 11.73 for the quarter. Keep up the great work guys. I am not a member but regularly keep tabs on your fantastic site. I don't have Net access at home so can only sneak time here and there at work. As soon as I do get a permanent connection I will subscribe immediately. A mate just forwarded this link to me - "http://cgi.ebay.com/ebaymotors/ws/eBayISAPI.dll?ViewItem&item=1842429471" - and I thought you might be interested in it. I have already made my mind up on this item but I am curious to see what you blokes think. Keep up the fantastic work. PS: The intercooler water spray controller works fantastic but does stay on too long for some of the roads in the Northern Territory. I'd like to think you're of the same mind as everyone in the AS office - what a load of rubbish! Hi, just a couple of quick ones. Regarding: Promise Delivered about the Ford Falcon upgrade ("Promise Delivered"I wonder if you know of any New Zealand distributors of Jim Mock's DEV kits for the Ford Falcon? Re: New Car Test - Ralliart Magna: Would the 5-speed auto alleviate the traction problems you have encountered with that car? Although it lacks the LSD, the auto comes with traction control. 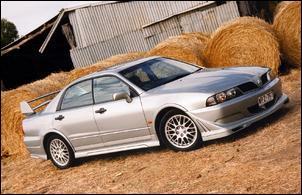 (According to the Mitsubishi NZ website anyway). Dear AutoSpeed ...or should I say AutoSped. Gee, the content has gone downhill in the last week or two. Reviews of family sedans - the Toyota Corolla Ascent wagon and Magna in one issue? Where is the performance stuff? Maybe if you want to experiment in marketing to a more mainstream audience, you should split your subscriber based by personalised preference (let them choose) and pitch the different content to the different audience. For mine - feel free to leave out the Magna or Toyota Corolla reviews. I won't hang around for that type of stuff anyway. Being one of the quickest cars in Australia, the 180kW Ralliart Magna is exactly the type of car you'll continue to see in AutoSpeed.